Senior cats, like people, need more focussed healthcare and attention as they age. Most vets consider cats ‘senior’ from the age of 7 and will recommend six-monthly wellness checkups rather than the usual annual veterinary exam. This is because cats are very good at hiding illness and the signs and symptoms may be so subtle only a proper examination can detect them. As with all illnesses, the earlier a disease is detected the better the chance of treatment. Osteoarthritis: Arthritis in cats is a degenerative joint disease that affects over 90 percent of cats at 10 years of age. Hyperthyroidism: Weight loss, increased appetite and vocalisation are hallmarks of hyperthyroidism in cats. Inflammatory bowel disease: Vomiting, diarrhoea and weight loss are the most typical symptoms of this very common middle-age and senior cat problem. Diabetes: This is a common disease of older cats, especially those that are overweight. Cancer: Intestinal, mammary and oral cancers are all more common in senior cats. Mammary cancer is a huge risk factor in cats that have not been sterilised. Cognitive Dysfunction Syndrome: 80 percent of cats have cognitive dysfunction at 15 years of age and older. A complete physical exam is recommended every six months for all cats over 7 years. If that seems like a lot, consider that biannual vet visits would be the equivalent of a human seeing their doctor every three to four years. 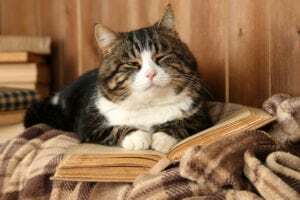 Since cats are notorious for hiding their diseases and often have more than one problem, exams and wellness testing are the cornerstones of keeping a senior cat healthy. Routine blood pressure checks are advised in all cats over 10 years of age and in cats with diseases commonly associated with hypertension (kidney, diabetes and hyperthyroidism). Additionally, abdominal ultrasound or chest or abdominal radiographs are indicated to help screen for disease. Make sure you are meeting all your cat’s needs (water, food, litter box, social interactions and resting, sleeping and hiding spaces). Going for regular veterinary visits yearly up to age 7 and every six months after are the absolute best things a pet owner can do. Regular weigh-ins at home are very helpful. Buy a good-quality baby scale to catch sudden weight loss early and easily. Observe your senior cat closely. Any change can mean something is going on. With cats ageing five to seven times as fast as humans do, any change is important to take note of. Easy access to fresh water. Use wide bowls to avoid “whisker fatigue,” and avoid plastic bowls to help prevent chin acne. Low-entry litter boxes will make it easier for older cats to get in and out. If your cat is arthritic, make sure the litter boxes are placed in easily accessible areas, without your cat having to climb a bunch of stairs to get to one. Your cat’s annual blood work is a great way for veterinarians to determine if a change in nutrition is needed for your senior cat. Protein level and phosphorous levels are two of the most critical analyses that need to be considered. 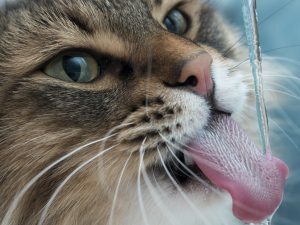 If a cat has renal disease or a history of bladder stones, a canned food diet fed in small but frequent portions is a great way to encourage water consumption and achieve a diet that is close to the natural diet of a cat. Any diet switch should be done slowly in cats, especially seniors, and is best done with the guidance of your veterinarian based on physical exam and wellness test findings. By being a vigilant and responsible cat owner, you can help your cat stretch his golden years into old age.